Posted by Teresa Mihelic HelpDesk on Friday, February 8th, 2013 at 10:05am. Celebrating more than three decades of Southern California's automotive heritage, the Orange County Collector Car & Motorcycle Weekend™ will host enthusiasts and families to an exceptional three-day weekend of parties, tours, art exhibits and Sunday's marquee event, the Dana Point Concours d'Elegance®. 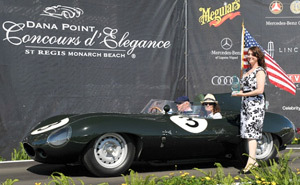 Nestled on the golf links of the St. Regis Monarch Beach, the Dana Point Concours d'Elegance® will host over 200 of the best-kept classic cars and motorcycles, display proudly on the lawn.